WCPE Episode 170 – Interview with Dave Gibbons at Rose City Comic Con – WORST. COMIC. PODCAST. EVER! The 2017 Rose City Comic Con is in the books, and the Worst. Comic. Podcast. EVER! is proud to have been right in the middle of it all. Over the weekend, we spent three incredible days working the Hero Initiative booth, managing donation buckets in artist alley, and meeting some of the coolest comic fans in America. Oh yeah, and we also spent some time with creator Dave Gibbons. Yes, that DAVE GIBBONS! We took some time out on Sunday afternoon to sit down with Dave and chat for a few minutes about Watchmen, Superman Annual #11 and his work on the big screen. This comes hours after we hosted his panel at Rose City Comic Con. Don’t believe us? Check out our Facebook feed from last Sunday morning! We spend the rest of the episode catching up on Rose City – the people we met, friends we saw, and goodies we purchased. A special thank you goes out to Silk Spectre/Black Cat, who brought us the Brazilian Brownies on Sunday. We would be remiss if we did not mention the passing of writer Len Wein, as the news broke late in the day on Sunday at the con. Len is one of the most influential creators of all time, helping to create the likes of Swamp Thing, Wolverine, the All-New X-Men, and more. He also edited Watchmen with Alan Moore and Dave Gibbons. It’s because of creators like Len and Dave that we proudly donate our time (and money!) 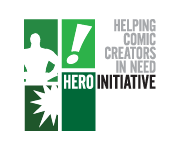 to the Hero Initiative, and we encourage you to do that too.